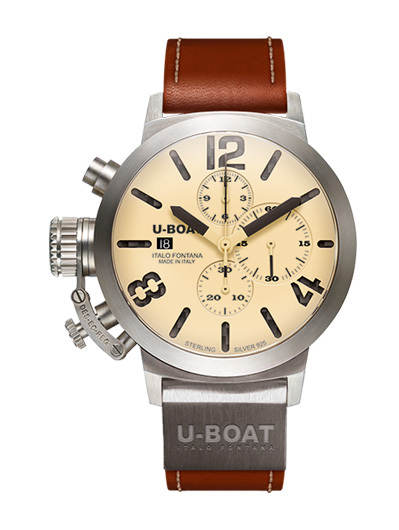 MOVEMENT: automatic mechanical chronograph modified and personalized to U-Boat specifications for date display and stem position at 9 o’clock. Power reserve: 44 hours. 25 jewels. Height: 7 mm. Frequency: 28.800 vibrations per hour, 4 Hz. CASE: sterling silver, crown on left side, with a special protective device. Diameter: 48 mm. Case silver weight: 104,80 gr approx. Thickness: 18,10 mm. BACK: sealed with 8 external screws, with small crystal sapphire showing the movement balancer. DIAL: two superimposed dials, one in black carbon fiber, the other one cut, treated with composite beige pigments. Arabic numerals. Black hands. CRYSTAL: high quality flat sapphire, scratchproof. 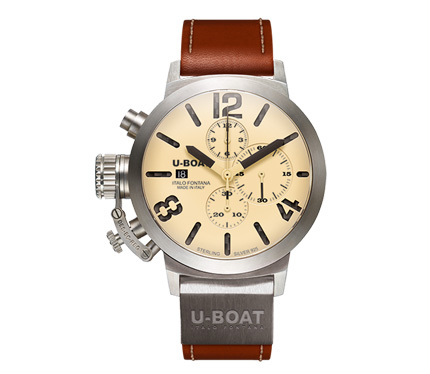 STRAP: hand made and hand finished calf brown leather and beige alligator lining. Width: 23/22 mm. Deployante buckle cover in sterling silver weight: 28 gr approx. Sterling silver plate weight: 22 gr approx.